If you want to add warmth and beauty to any room in your home, renovating your floors may be the best place to start. With beautiful new hardwood flooring, you can set the stage for your home décor and design to truly shine. The luster of a hardwood floor can make any room welcoming and attractive. The unique beauty of hardwood adds style and value to any home or business building. This material also offers the additional benefit of being easy to clean, which means you spend less time on maintenance and more on things that matter. When you browse our flooring showroom, you’ll see all the different types of hardwood floors we offer. We offer a full selection of affordable options for any design, style, or color that you want. Hundreds of locally owned stores form our national network, which gives us substantial buying power – which we use to your advantage. Buying wholesale allows us to pass these savings on to you in the form of our guaranteed low prices. You won’t find the same product in the same brand for a better price anywhere, and our guarantee proves that we’re willing to bet on it. Quality hardwood floors never go out of style and, no matter what your choice of grain, species, stain or plank, you can always refinish it and leave it looking brand new once again. With that kind of elegance and character, even the most unassuming room in your home can be a masterpiece. With the myriad of options you can choose from, you are certain to find exactly what you are looking for. The ease of maintenance, durability, and easy grace of hardwood flooring will be a point of pride in your home for many years to come. Along with your enjoyment of your house, this renovation decision also increases the market value of your home. From a glowing oak hardwood floor to gleaming Brazilian cherry hardwood, we carry many aesthetic types in stock. Whether you choose the benefits of solid or engineered hardwood floors, you can find any look you want. 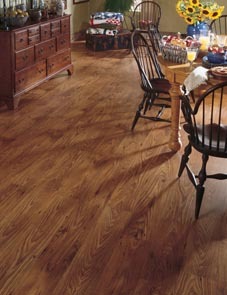 Strip flooring, for example, adds a traditional feel to a room while making the space seem larger. Even if you choose a darker stain for your flooring material, the clean lines still have the effect of opening up a space and making it visually uncluttered. This type of flooring comes in strips that range from 1" to 2.5," and in various thicknesses that range from 5/16" to 3/4". With wider strips that range from 3" to 8," plank flooring is noted for its earthy, naturalistic appeal, and complements a room décor with antiques or historical items. Handscraped flooring has become a more and more popular trend, due in part to the timeless appeal it can offer a space. It creates a simultaneously modern and rustic appeal. This is enhanced by the advanced urethane finishes which are also popular today. We also have bamboo and cork options for our environmentally conscious customers to peruse. Wire brushed floors are as charming a style as any. They offer a subtler application of the popular distressed aesthetic, in combination with the enhanced appeal offered by innovations in urethane finishes. Hardwood floors create an effortless warmth and elegance in any room of your house, even the basement. If you’re interested in turning a basement or room into a gathering place for your friends and family, or simply giving your home-design a focal point, this flooring choice is perfect for you. In addition to our skilled and seasoned team of flooring and design professionals, we also offer hardwood flooring installation from experienced and highly-trained professional installers. Our installation technicians can deliver and install any selection of flooring you choose, and complete the installation process in any room in your home with efficiency. You don’t have to be inconvenienced by contractors who won’t complete the job in a reasonable timeframe, because we only associate with the best in the business. Our Flooring America Assurance Guarantee ensures that if you’re not satisfied with your new floor, we will replace it with another floor of equal or lesser value. We are that confident that you’ll find what you’re looking for and you’ll love it for years to come. Find the hardwood flooring of your dreams, with a satisfaction guarantee that can't be beaten. When you visit our showroom, our dedicated associates will be happy to help you find the ideal flooring for your home. Contact us today to speak with one of our knowledgeable team members about why hardwood flooring is right for you. Our store is proud to serve customers in Chandler, Phoenix, Tempe, Gilbert, and Ahwatukee, Arizona, plus the surrounding areas.